Proposed mixed-use building. Click image to enlarge. Around this time last year, I posted about Willoughby Town Centre which is a proposed 20-arce mixed-use development that is being constructed near 208th Street and 80th Avenue. Work has finished on the main high street through the project, Willoughby Town Centre Drive, and construction has started on a new grocery store and strip mall. The Township of Langley will be holding a public hearing tonight on the first of the proposed mixed-use buildings along the high street. This building will contain retail on the ground floor, plus 3 floors of residential units. What this project gets right is that surface parking is at the rear of the mixed-use buildings as opposed to the front. This would seem logical when developing a walkable area, but in Walnut Grove similar mixed-use buildings have surface parking in the front of them which makes nothing more than strip malls with houses on top. 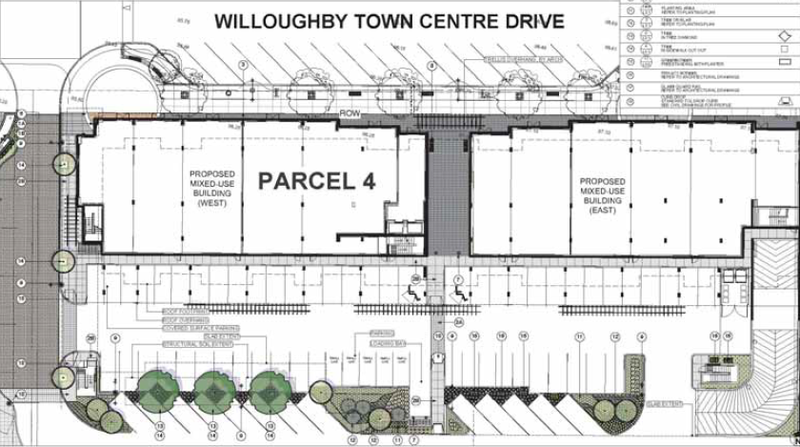 Overall phase one plan of Willoughby Town Centre. 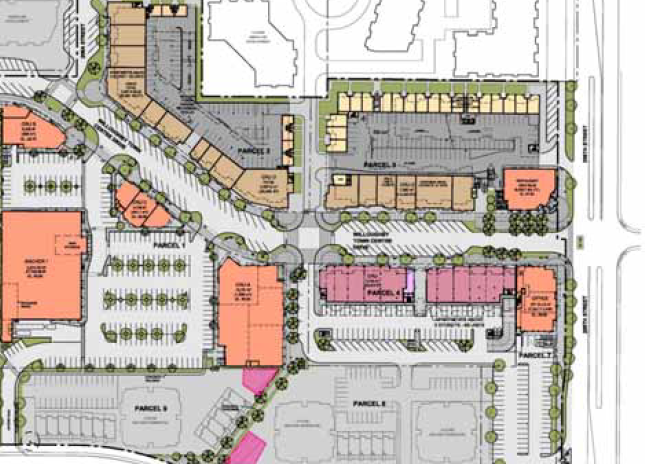 Site plan for proposed mixed-use building. Willoughby Town Centre does a better job of creating a walkable neighbourhood, but I have a few concerns about the surface parking. This project contains underground parking under the surface parking which means that the surface parking will likely stay in place for the next 25+ years. With this in mind, it is important that parking doesn’t hinder the public realm. For the proposed mixed-use building, the developer does a good job of preserving the pedestrian public realm, but the entire southeast corner of the overall phase one of Willoughby Town Centre (where the grocery store is being build) is just a normal strip mall with parking front and centre. It’s a shame because I really think that this is a lost opportunity to build a true town centre. For example instead of a parking lot, imagine if it was a public square? Anyway, I’ll continue to following this project as it builds out over the next few years.